What better way to start an article on multiple Nessies than this recent creation by Jack Rumney? 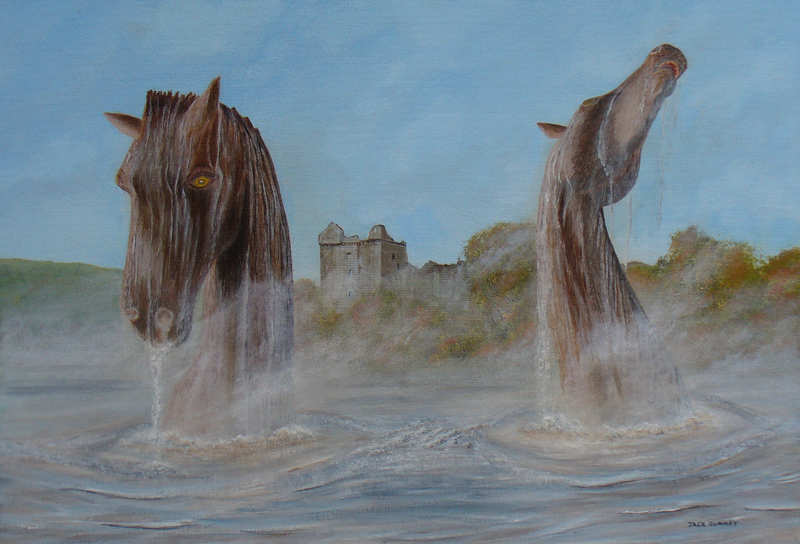 Being inspired by the new Kelpie statues near Falkirk, he transported them to the home of Kelpies, Loch Ness. As said here before, Loch Ness has more weird creature stories associated with it than any other Scottish loch (and perhaps any other lake cryptid). One monster and smaller one swimming side by side. Two humps half a mile apart. Two creatures inferred by time and distance between Urquhart Bay and Fort Augustus. Two huge objects (one fin-like) moving 100 yards away between Altsigh and Castle. One was forward and to right of other. Two eight foot necks with cow like heads at point opposite "Johnnies Point" moving about. Two humps 15ft apart near Fraser's Point. Monster reported at Foyers and then within 15 minutes at Borlum Bay 10 miles away. Three small creatures seen swimming away from stern of boat near Fort Augustus. Three feet long, lizard like with four rudimentary limbs and distinct necks. At Brachla near Abriachan. Big, black, shiny object with two smaller ones either side. Two humps moving in parallel and a few yards apart moving up loch, breaking surface every 200 yards or so. Large animal seen moving towards Corrie's Cave while a similar object disturbed water near Horseshoe. A report of three monsters seen from the air (heads only). Three heads seen moving in V formation towards shore, no necks. Seen near Dores, two objects initially mistaken for rowing boats 150 yards apart. One did a right angle turn around the other and then both disappeared. Seen from a hillside a mile away. One large hump heading diagonally across the loch while the other lying quietly beside. Seen near Fort Augustus Abbey. Three pairs of double humps, each extending about 20 feet. Sunk in unison and seen at half mile distance. Head and neck with double hump with smaller one hump and head neck splashing behind. Seen at 300 yards from Fort Augustus. Two small creatures seen in stream heading towards loch. Four triangular humps moving about. To give you some detail on some of these events, case number two is shown below (click to enlarge). Then we have the extremely rare case of two long necks being seen. This is case number five and I actually did not know about this report until recently when I did a more focused search at the library. It is a collector's item, only one of two reports made of two long necks. If anyone thinks they can add to this list, let me know. So what does the list tell us? Firstly, one item on this list tells us that not everything is to be explicitly trusted. You may guess I am referring to Frank Searle's story of seeing two juvenile Nessies clambering in a stream. Now whether Frank is telling the truth here is largely lost in the noise of his known hoaxing. If I had to start filtering supposed hoaxes and misidentifications from what is dubbed "real", there would be plenty of scope for our own bias and prejudice to skew the outcome. So everything stays. The most creatures reported are four in our last account but the complete list is twelve sightings of two creatures, six sightings of three and one of four. At least five of the nineteen reports involve smaller creatures accompanied or unaccompanied by what one may call the adult. There are no reports of multiple creatures seen on land. Note we only cover multiple visual sightings and not sonar. I have not looked into sonar contacts in regard to whether they display multiple and simultaneous hits. But what constitutes a multiple sighting? Obviously, when two long necks are reported or humps are travelling in parallel as opposed to in sequence then we can mark those as multiple. However, some are less clear. Case number six refers to two humps fifteen feet apart. Now, it could be conceived that this is one creature or two. Each case has to be assessed on its individual facts. So, for example, it may be speculated that the famous MacNab photograph is in fact two creatures, one smaller than the other (this is my own opinion). Roy Mackal in his study of sightings for his book "The Monsters of Loch Ness" had 66 out of 251 sightings display two or more humps (26%). A fair number of these could be multiple animals, but it would be pretty much a subjective judgement as to which is which. The other factor is time and space as demonstrated by cases 3 and 7 where single creatures are observed but separated by a large distance and short time. The presumption here is that the first creature observed could not get to the location of the second sighting in time and therefore these are distinct animals. Again, there is a degree of subjectivity involved here in how fast a Loch Ness Monster is inclined to move. My own view is that these creatures are largely inert but can move when a suitably large threat or opportunity arises. Things become more interesting when the distribution of sightings is analysed. The spatial distribution looks unremarkable and accords with a random spread but this cannot be said of the temporal distribution. The first thing that struck me was how 26% of the reports happened within a mere 20 day period over June and July 1934! These five cases occurred during one of the busiest periods for Loch Ness Monster reports. Between June and July 1934, we have about 50 reported cases and so our five cases constitute 10% of that record as opposed to the overall statistic of 1.7% which makes it nearly six times higher. The year 1937 is also curious in giving us 3 reports out of a total of about 23 reports but the 20 day period in 1934 particularly raises a question I will return to. The final anomaly is of the opposite kind in that we have no cases of multiple monsters reported since 1976! That is a gap of 37 years which seems intolerable from a random, statistical point of view. If we extrapolate the post-war period reports beyond 1976 out to 2013, we may reasonably expect perhaps 8 or 9 reports. A big zero would seem to defy expectations, no matter which way it was viewed. So why the big gap? Doubtless, the drop in recording of sightings has contributed to this void, though I am not entirely convinced this is the sole reason. Is the feared drop in the monster population due to overfishing of the surrounding waters being reflected in this statistical space? I sincerely hope not and rather hope that a closer look at that period of time may yet yield something. So what can be gleaned from this subset of the sightings database? 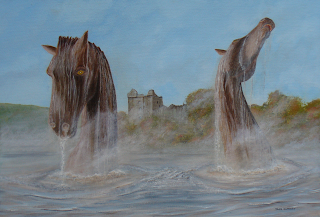 A result of less than 2% of the entire database suggests that the Loch Ness Monster is no pack animal. This analysis suggests the Loch Ness Monster is more a tiger than a lion. Most of a creature's life may be spent in isolation ploughing lonely furrows along the deep basins of the loch (when it can be bothered to move). One may then presume that proximity of creatures happen for at least three rare reasons, raising offspring, mating and territorial conflict. The first we see in several of the reports though the other two are somewhat more difficult to demonstrate. The lack of multiple large creatures would suggest mating is not a frequent event (i.e. it is multiennial). Considering the creatures live in darkness, it is no surprise that I will now compare them to the reproductive cycles of deep sea fish where animal growth is slow, longevity is long and sexual maturity is reached at an age comparable to humans. The lack of multiple animal sightings is consistent with this view. Territoriality is a more complex matter requiring a more detailed analysis of the sightings database. I will leave that for another day. Though not a full explanation, the statistical anomaly previously mentioned for the summer of 1934 has some explanation in multiple animals. It is a well known theory that the road blasting and dumping of numerous tonnes of rubble into the loch during the A82 upgrade stirred the Loch Ness Monster to the surface. The year of 1934 has the highest proportion of reports at about 140 or nearly 13% of the total whereas the annual average is more like 1.25% per annum. If multiple animals as opposed to one animal are being stirred from the depths during those seminal years of 1933 and 1934, then a multiplication of sightings is more understandable (though I suggest not the only explanation). Why we should have such a high concentration of multiple creatures over a 20 day period is not known or accountable from our monster theory. It is simply not known what went on over that period of time. Now if you are sceptical about all these musings about creatures in Loch Ness, I now focus on how all this applies to the conventional sceptical theory on the Loch Ness Monster. Or to put it another way, does the sceptical theory predict that only about 2% of reports will be of multiple monsters? I suggest it doesn't make any predictions at all expect in a broad, general sense and it is a reactive rather than proactive theory. By that I mean, the theory is mainly brought out when a sighting makes the news, some normal explanation is offered and it is then put back in the box. Actual quantitative studies based on the theory are few and far between. In other words, the theory lacks detail and precision. So when the question is asked "What percentage of reports will be of multiple monsters? ", do not expect an answer. However, it is my opinion that the theory is flawed and our 2% is lower than the sceptical theory would allow. As you can guess, the theory is a composite one in which "Nessies" turn out to be wave effects, debris, animal, hoaxes and so on. Now within each of these subsets there is scope to allow for the so called misperception of multiple Nessies. For example, witnesses misidentify logs, birds, otters and deer as Loch Ness Monsters. Each of these has the potential to create a "long neck" event. The total percentage of single long neck sightings is less than 10%. The total percentage for multiple long neck sightings is less than 0.2% which is one fiftieth of the single neck total. Water fowl and otters are not solitary creatures and there is always a good chance that when one is seen there will be another within the field of view. Better than one in fifty I would suggest. The same applies to tree debris being washed into the loch from streams, there is again a good chance of two logs putting in an appearance. In the case of deer swimming across the loch, it is accepted that these rare events tend to be singular. When I met sceptical Loch Ness researcher Adrian Shine at the recent "Nessie at 80" event, I put the question to him why multiple long neck reports are so rare. His reply was that people are less likely to be fooled by two birds than one. I agree that the more birds you see, the less likely you are to see monsters, but on reflection, how true can that be for just two necks? For example, people readily report multiple humps. As mentioned above, they made up 26% of Roy Mackal's analysis. The readiness with which people see two or more humps suggests (from the sceptical theory point of view) that multiple long necks should not be as rare as the statistics suggest. Likewise, it is strange that humps seen in a configuration suggestive of multiple animals (i.e. in parallel or a sufficient distance apart) are not more reported. The sceptical theory tells us that the waters of Loch Ness present a fluid and dynamic environment for all manner of strange hump like events to be seen. Yet only 14 of the 19 reports above fall into that category giving us a paltry 1.3% return over 80 years. May I suggest that this is not enough? Then there is the mystery of the twenty days of multiple creature events in June and July 1934. How does the sceptical theory account for this? Birds, deer, otters and logs are pretty seasonal and predictable in their behaviour and so patterns of events should not be so concentrated according to the sceptical theory. Clearly, some event happened back then which caused a flurry of "multiple creature" events. A catalyst that was unlikely to cause a repeat again for the next 80 years. Sceptically minded replies are welcomed. One suggestion that can be dismissed is the suggestion that two seals got into Loch Ness at that time. This theory was suggested by one sceptic to account for the spring 1933 sighting by the Mackays. To suggest our mythical pair of pinnipeds were still there over a year later is simplistic - as is the suggestion they came back. In fact, it is highly unlikely that two regularly surfacing seals would have escaped everyone's attention during a time when the loch was being so keenly observed. Seals are regularly searched for by the authorities so as to not disrupt the salmon runs. There is no report of any seals in Loch Ness during those times and so we take it that none existed. And finally, how does the sceptical theory accommodate the fact that no multiple sightings have occurred since 1976? Surely something is also wrong there? Now if we credit witnesses with being more credible than the sceptical theory implies, then it is less of an anomaly that so few reports are of multiple creatures. Misidentifications and hoaxes form a minority of the reports and so the percentages drop. Moreover, statistical anomalies are less anomalous when a non-seasonal group of monsters is introduced to the mix. It is admitted that a "monster" theory can also lack precision and detail in these matters (we can't even agree on the subphylum). But I am not the one admitting that the mystery has been solved by the application of logic, science and critical thinking. It is clear to me the conventional sceptical theory is no better in that regard (if not worse). The record states that we have multiple large creatures in Loch Ness. The upper limit of four implied in these reports should not be regarded as the actual number inhabiting the loch. It is hoped that some recent multiple animal report will turn up to confirm all is well population wise at Loch Ness.